Today I thought I’d show you guys these Anker Lightning Cables. For those of you who don’t know Lightning cables are the type of USB cables used to charge and sync the iPhone. I had planned on this being an unboxing video, but well lets just say I had “technical difficulties”. The cables are already out of the box, but I can still show them to you. I bought these new Anker Lightning cables from Amazon. We have a few iPhones in use here in the house and some how these charging cables just seem to disappear, so it was time to pick up some new ones. Those of you who have watched the channel for a while know that I like Anker products, so I decided order their lightning cables. Now when I shop for lightning cables I look for several features. First is quality. I make sure the cables I am buying are Apple’s Made for iPhone or MFI certified and look for that logo on the box. While this alone doesn’t guarantee a quality cable, in the past I have tried the really cheap cables that aren’t certified and they either don’t work or break soon after. After that I look for the right length. Cables come in different lengths. A shorter cable may be great for charging and syncing to your computer on your desk. A longer cable may be better for sitting on the couch, using your phone in bed, or be able to reach the back seat of your car. If you get a cable that’s too short, you may have trouble using your phone when it’s plugged in or putting strain on both your iPhone and the cable. If a cable is too long, the excess cable ends up in the way. I also check the diameter of the cable to make sure its not to thick. Thinner cables are more flexible and easier to work with while thicker ones can be much stiffer. The Apple branded cables are very thin and flexible while remaining durable and high quality. I look for a cable with a lightning connector as close in size as the ones on Apple’s cable. If the lightning connector on your cable is too big or thick it may not work with your iPhone case. Case designers make sure that the Apple cables fit their cases but not all the different third party cables. First, here is the Anker 3ft lightning cable. It comes in black and white. You can see I chose black. It’s thin and flexible and when I compare it to the Apple 1M lighting cable that came with my iPhone 7, the cable diameter can connector size are pretty close. Next I have the Anker 6 ft lightning cable. I bought a 2 pack of 6 ft cables. It included one black and one white cables. The cable looks good. But when I compare it to Apple’s 2M lightning cable you can see that Apple’s cable is noticeable thinner. The Anker cable comes with the small Velcro strap so it can be neatly rolled up. You’ll see I uses some tape to wrap up my Apple 2m cable just to keep it rolled up while making the video. So what are the other differences? The Anker cables come in both black and white, while the Apple cables on come in white. The Anker 3 ft cable is 3 inches shorter than the Apple 1M cable. The Anker 3ft cable only costs $7.99 while Apple’s 1m cable cost $19. You can buy two Anker cables for less than 1 Apple cable. The Anker 6t cable is 6 inches shorter than Apple’s 2M cable. The Anker also comes in black or white, while the Apple cable only comes in white. Anker’s cable is thicker. The Anker cable includes that velcro strap. 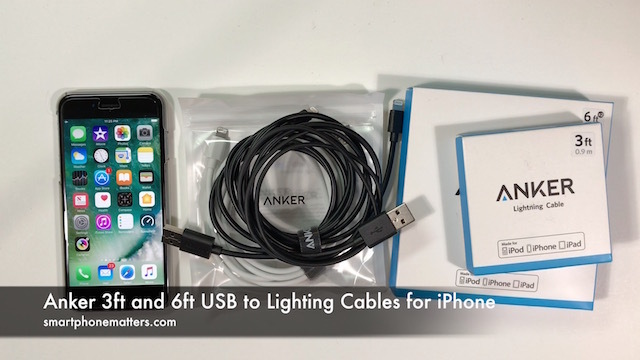 The Anker 2 pack costs $16.99 white Apple’s 2M cable costs $29 meaning you can get two cables for a little more than haalkf the cost of the Apple cable. I put some Amazon links in the description below and in my article on smartphonematters.com. If the use the links to buy the cables or when you shop on Amazon, you’ll help support the channel at no extra cost to you. What about you? Do you use Anker products or like a different brand? Leave a comment and share. I’m a BIG fan of Anker, I have a few lightning cables, and I have bought 2 different versions of their Bluetooth speakers. VERY happy, I have even sent speakers as gifts. Sign up for their user account option on their website, they give you some discounts to use on your first purchases. They do also often send discount codes for Amazon purchase, but this sign up discount is for stuff only from their website. They send you contests and sale info on a regular basis. Their website is a bit clunky to me, adding the “coupon code” for the first thing I bought confused me, but I finally figured it out. They have a first rate set of LED flashlights even, First rate quality in everything I have bough. And they now have a series of braided lightning cables, I’m pretty sure that was Anker I recently saw an e-mail about. I’m not affiliated with Bob’s blog, I’m just posting twice today trying to “give back” since Bob gave me some Verizon tips that I really benefited from.